So today is the first Tasty Tuesday. I'm kind of really excited. You can read about it and get the button here. 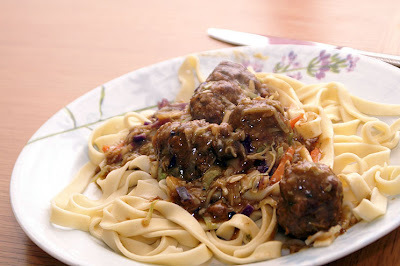 Even if you're not a blogger, please share your recipe in the "comments" section of today's post! Please link directly to your recipe and not to the main page of your blog (so if we click on your link a few weeks from now we'll go straight to your yummy recipe post!). Adapted from The Mixer Bible by Deeds and Snyder. We're having a priest over for dinner tonight and these are fancy enough to make for him, but easy and delicious enough that I'm not stressing out. Okay, I know what you're thinking: "cardamom and coriander? I don't have those!" Well, don't buy them if you don't have them, but they do add a really nice flavor if you do. (And I don't think I've ever added 1/2 tsp of anything... these are just suggestions). 1. Mix all ingredients except butter, flour, and stock. 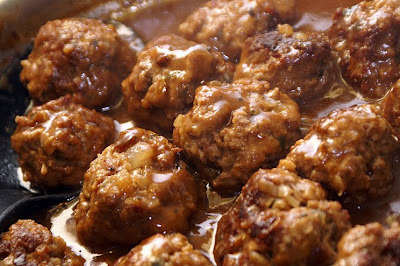 Roll meat mixture into 1 inch balls. 2. 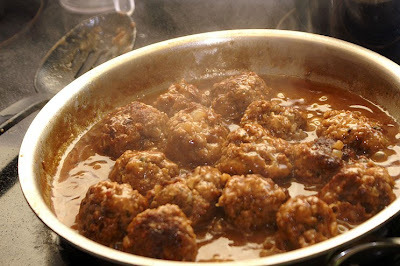 Melt 2 tbsp of the butter over medium/high heat, add meatballs and saute until browned. Transfer to another plate, add the remaining 2 tbsp butter. Add flour and cook, stirring for 2 to 3 minutes, or until roux becomes foamy. Add stock/wine and cook, scraping any bits on the bottom until thickened (about 5 minutes). 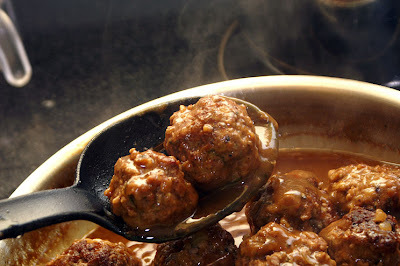 Return meatballs to the skillet, reduce heat, cover and simmer for 30 minutes to allow flavors to blend. 3. If you're going to add cabbage, add it within the last 5 minutes of cooking, or just until wilted. 4. Serve over mashed potatoes, rice or noodles... or on a hoagie bun. Definitely serve with a beer. In the interest of full disclosure (so y'all will know sometimes I cheat) I used packaged brown gravy last time I made this. And it was beautiful, but my husband tasted it right away. "This tastes a little... packaged." So this time I'll be skipping the package and using the flour/stock. I added some coleslaw mix to this last time, but now I have a head of cabbage so there won't be any carrots. I'll start my exercise regime tomorrow. I linked a really easy nacho dip that I made for our Super Bowl party. Looking forward to reading more tasty recipes! 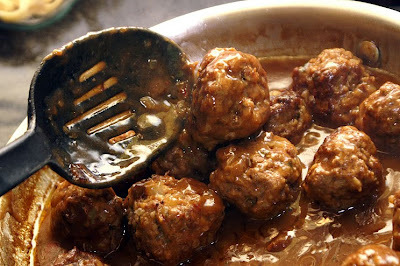 Oh, and I'm going to try your Swedish meatballs recipe because I've been looking for an easy one! Thanks! Sweet. I think this should be fun. My link: Cheesy potato soup, a Friday food that doesn't taste like penance. I don't have a blog, but I love yours! I posted a recipe for chocolate chip cookie dough truffles (since I noticed last week you like cookie dough). No raw eggs and they look yummy. I don't have a blog, either, but this idea looks great! I posted a link for a cheesecake that looks tasty. I haven't made it yet but it's on my "to do list"! Love your blog!! Thanks for hosting this.